Deeply, refreshingly pungent and earthy. Grapefruit zest, dark chocolate, candied ginger, graham cracker, moist fresh-fallen leaves in aroma and cup. Structured around complexly layered tart, sweet and savory tastes; plush, syrupy mouthfeel. Sweet, deeply flavor-saturated finish. This exceptional coffee was selected as the No. 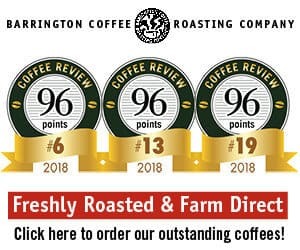 9 coffee on Coffee Review’s list of the Top 30 Coffees of 2018. This coffee tied for the top rating in a cupping of Value Coffees for Coffee Review‘s March 2018 tasting report. Produced by smallholding farmers from the Ateng, Jember and Garundang varieties of Arabica. Coffees like this one from the northern part of the Indonesian island of Sumatra are valued for their complex earth and fruit notes that appear to result largely from unorthodox fruit removal and drying practices called “wet-hulling.” This is a particularly refined example of the type, produced in the Lintong region south of Lake Toba, one of the oldest and arguably the most admired of Sumatra growing regions. Klatch Coffee is an award-winning small-batch roasting company in the Los Angeles area whose resident barista and trainer, Heather Perry, won both the 2003 and 2007 United States Barista Championships brewing a Klatch Coffee espresso blend. Visit www.klatchroasting.com or call 877-455-2824 for more information. 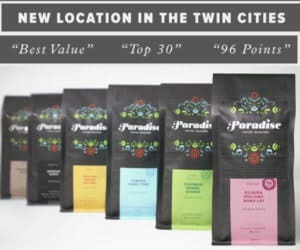 The Bottom Line: A fine Sumatra, simultaneously expressing the pungent, full, resonantly earthy genius of the type, while lifting it with refreshing lightness and complex vivacity.